Irish Funds events provide sponsors with unparalleled access to clients and key decision makers in the domestic and international fund industry. 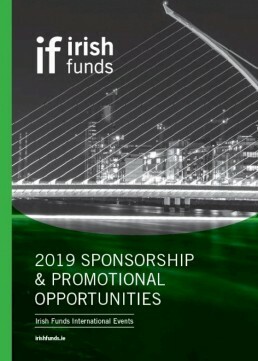 Sponsoring Irish Funds events provides a strong return on investment – including branding opportunities, pre-event access to delegate lists to facilitate networking, exhibition spaces, press and publicity opportunities, and corporate hospitality. We are happy to work with sponsors at all times to ensure a successful partnership and an optimal outcome for all involved. Read testimonials from some of our Premium Sponsors. Irish Funds has a range of sponsorship options to accommodate a variety of different budgets and promotional goals. To view all current opportunities please view our sponsorship brochure. If you have any questions in relation to Irish Funds events and how you may get involved please feel free to contact us on +353 (0) 1 675 3200 or email events@irishfunds.ie. Read about what some of our premium sponsors have to say about promotional opportunities at Irish Funds.